One of the more popular names in the bodybuilding world and mostly known for his supplement reviews, Tim Muriello comes up with a product of his own. With a tub design that can give you seizures and a pretty crazy name, we’re going to see if Tim’s designed a pre-workout that can live to the name and to Tim’s own reputation!. This is what a fully loaded pre-workout’s label should look like! This is definitely a one scoop product with tons of actives to get you going (30 times…). You might recognize some of the ingredients from other pre-workouts, but we’ll still be glad to explain to you what each one does. 400mg Caffeine (300mg Caffeine Anhydrous + 100mg Green Tea) Not a common ingredient to see in a product, Vitamin B12 is here to keep you energized after getting hit with the energy surge from the stimulants. Instead of using all that energy in the workout, you get and energy reserve for when you finish it, which is a nice addition to this product. Caffeine is the most common energy boosting ingredient in the pre-workout world, and rightly so. It’s effectiveness is unquestionable, and 400mg would pretty much have an effect even on The Hulk. Endurance & Strength 2g Taurine Taurine is a performance enhancer, boosting strength and muscle recovery. Though it failed to do so in a couple of studies, we still think it does its job pretty well. 2g is double the amount you might see in the average pre-workouts using this ingredient, so you would think Tim Muriello takes this one seriously. 200mg L-Norvaline Niacin is a common ingredient to see in a pre-workout, It opens up blood vessel allowing better blood flow which results in better pumps. 40mg is a generous dose! L-Citrulline is the best form of Citrulline and a very good and proven ingredient. It is known, like niacin, to open blood vessel resulting in better pumps. Tim Muriello hit the spot with this one, giving us a super good 4.5g of it. L-Norvaline is a bit of a question in this product, since it still isn’t proven to work on humans, but it does work on non-humans, but we still can’t be sure. DMHA has become the the most common replacement for DMAA, which was banned to use by the FDA. DMHA is less extreme than the DMAA, being a less powerful, but still a lot of products use it and it gets positive feedback, so we like that the SPAZMATIC has it. Hordenine and Higenamine are both known to increase mental focus and mental energy, and both are very good at doing that. Both doses are just what we would like to see too, and we LOVE it. L-Tyrosine is another very good focus booster, which seems to be a stacked area in this product. 1g is just the clinical dose for it so it gives this product another good reason to use it. Tim Muriello comes up with a super dosed & promising formula for his product, without sparing in quality or costs. With all the coolest and hottest ingredients in what seems to be a perfect balance of energy, power and focus. The formula is reminiscent of several top rated Pre-Workouts we already reviewed, like Redcon1 Total War and Iron Addicts Sidewalk Kraka. Best Flavors & Mixability – Spazmatic currently comes in only one flavor, the Watermelon Taffy, but the great taste covers for the lack of choice in that department, which is just fine by us. Effectiveness – You get just what you’d expect from the SPAZMATIC, and you can feel its effect in every aspect of the workout. The pump is brilliant, the energy & focus is pure music. We loved the fact that Spazmatic hits you right away (I hate the wait!) . The bottom line, Tim has delivered a top notch product! 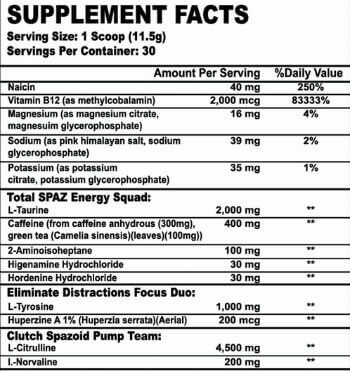 For a real 30 serving tub (meaning each serving is 1 scoop only) you can get the SPAZMATIC for $35.59, which for what you get, is a on par with its competition. As you know by now, you can’t really compare a scoop of a fully dozed product like this to a ‘run of the mill’ product like C4. You’ll need 3 scoops of C4 to start to match the effect and even then, it will be way less impactful. Obviously we are on the hunt for Spazmatic deals & coupons and while we are hunting, you can always compare prices and find the lowest price for this pre-workout or any other supplement! Tim Muriello earned our respect for delivering a complete pre-workout that sits on par with the best out there. Packing all the best ingredients in perfect doses. For all of you looking for a strong, reliable pre-workout, that will get you going and will keep you pounding them weights…you SHOULD give this one a try! NOT SURE WHICH PRE-WORKOUT IS RIGHT FOR YOU? CHECK OUT OUR BEST 10 PRE-WORKOUT SUPPLEMENTS FOR 2017.